I’m going to open this article with the closing paragraph and, after reading it, if you choose to read through to the end, you’ll hopefully have a better understanding as to what it takes to run this organization. The OCWS is a volunteer, non-profit educational corporation. Although volunteering is not a requirement of membership, it is most certainly encouraged to help make us a success. I ask all of you to please take a look at the 2017-2018 Director Responsibility list posted in this edition of The Wine Press and consider becoming a part in running an event this coming year. Unfortunately, over a period of time, the Board has assumed the responsibility of not only running the affairs of the organization with just a small handful of other dedicated member volunteers, but also run most of the events as well. The end. Now, I would greatly appreciate you continuing to read from what was to be the beginning of this article. As I suspect you all know, the business of the OCWS is overseen by a Board of Directors made up of nine OCWS members who are die-hard volunteers. The only paid positions within the organization are those of the office staff, bookkeeper and Website Administrator, which are all hourly paid, part-time positions. Although the nine Directors each put in thousands of hours a year to run the engine, it’s the unsung and often unrecognized heroes of the organization that are the other hundreds of members who choose to volunteer and help run events throughout the year for whatever reason. Be it for the camaraderie, the feeling of knowing that they’re a part of something bigger than themselves or, maybe, just for the love of wine leftovers, these 400 or so volunteers are the ones to be thanked for running the entire vehicle when needed. Take, for example, our biggest fundraiser of the year, The Courtyard at the OC Fair. In addition to a core committee group of roughly 20 people, we had 322 volunteers overall that worked any number of positions before, throughout and after the 2017 OC Fair that made The Courtyard a raging success. The OCWS is afforded the opportunity to run The Courtyard and realize the profits in order to run the Commercial Wine and Homewine Competitions on behalf of the Orange County Fair and Events Center. Now, take into consideration that preparation for the competitions, both held in the beginning of June each year and both requiring as much help to run as The Courtyard, begins almost as soon as the prior year’s competitions are complete. All run by volunteers! Now, add into the equation our own cooking group, the Cook’s Caucus, who cater three OCWS events a year, the many pursuits of the Winemakers’ Group, the Marketing Committee, the wine sort, the wine auction, mini-tastings, monthly winery programs, Dine with Wine, the annual Spring and Fall membership events, etc., etc. All run by volunteers! We are an organization of almost 1,000 members, with approximately 40% of members volunteering. I’ve personally been approached more times than I care to recall with critiques of programs and events. Knowing there are lots of great ideas floating around in an organization with highly intelligent and motivated people, I would love to see those of you with new creative ideas, and the energy to help incorporate them step up to help keep the OCWS fun, informative and appealing. Your Board of Directors is here to encourage and support all efforts and is just waiting to hear from you. Please consider taking all those thoughts and ideas you’ve had and kept to yourself and put them into action. I truly hope to hear from you. Thank you. After many, many years of being supported by hundreds of Napa and Sonoma County wineries by wine submissions to the Commercial Wine Competition, it was our chance to support them in their time of need. 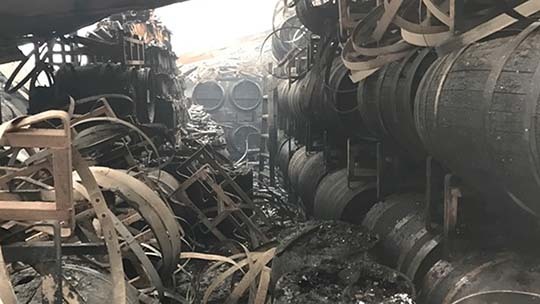 The Orange County Wine Society has made donations totaling $11,000 toward relief efforts for the Northern California fire victims. A donation of $5,000 has been made to the Sonoma County Resilience Fund, with another $5,000 to the Napa Valley Community Disaster Relief Fund. Both of these relief funds came highly recommended by several renowned winemakers who, out of the goodness of their hearts, act as Judges for the Commercial Wine Competition. Shelton Wines. Carol and her husband, Mitch, having also lost their home and belongings to the fires, did not look for help for themselves, but rather selflessly requested assistance for an employee, who also lost everything. Knowing Carol Shelton’s truly lovely heart, and appreciating all she has contributed to the Wine Society over the years, the OCWS could do nothing less than to help when asked. Besides requests for donations, the common message we received from hundreds of wineries is to support those areas hit hardest by the fires by continuing to visit the wineries and purchase wines. We have been told in any number of ways that the continued support of the wine country will be a huge boost to both the local economies and to the spirit of those communities. As OCWS members and wine lovers, the Board encourages you to visit the many wineries in Northern California, make a purchase to help boost the economy of the region and the many wineries who have supported the OCWS! Vivien Owen, a beloved member of the OCWS, sadly passed away on November 4, 2017. Her diminutive stature belied the enormous size of her generous heart and passion for giving. Vivien joined the Wine Society with her husband, Charley, the very first year of its founding, in 1978. Beginning with selling wine at the Fair each year, her passion for the organization led her to creating the displays at the Fair for many, many years and leaving a documented history of the OCWS by acting as historian until just a few years ago. She participated in just about every aspect of the organization at one time or another over the years and, most recently, enjoyed sharing her knowledge of wine and the OCWS with Fair attendees by being an OCWS Courtyard Ambassador during the OC Fair. Vivien’s life took her on many adventures with Charley, the most loved of which was raising a beautiful family together. Vivien was blessed with her daughter, Janet, who married Paul Peal, and her son, Jack, who married Sheila Lambert. She leaves her two children, their spouses, six grandchildren and four great-grandchildren with an amazing legacy. Born in Los Angeles, Vivien held a degree in Psychology from UCLA and a Life General Elementary teaching credential. During her professional career with the Tustin School District, she taught every grade level from Kindergarten to 12th grade, as well as special education classes. As a volunteer throughout the years, Vivien was second to none as a Girl Scout leader, holding any number of positions on PTO Boards and as President of the Tustin Area Woman’s Club, to name just a few of the many organizations and endeavors that were fortunate to have her leadership. Vivien found a different direction to her volunteerism after having served on the OC Grand Jury for a year. She joined the Past Grand Jurors Association and subsequently was appointed to the Water Facilities Corporation of the Municipal Water District of Orange County where she served a six year term. appointments by various County Supervisors, served as Chairman of the Board six times and was still serving upon her death. Vivien and Charley’s love for travel found them traversing California in a camper truck mostly visiting wineries and attending UCLA football games. Their camper travels within the USA found them visiting their son in Iowa and Florida, while bunking down in Elderhostels. Their cruise adventures found them going from Tahiti to Russia and back on U.S. soil in Alaska. Other adventures found Vivien joining Charley throughout his professional career in cities as exciting and diverse as London and Istanbul. So many more details about the life of this loving, passionate, highly intelligent woman are left unsaid here. Simply saying that Vivien touched countless lives during her own with her infectious smile and loving nature says it all. Her life was a blessing to all who knew her, her memory will be a treasure and she will be missed beyond measure. Our 2017 grapes have finished fermentation, and we have been racking our new wines into carboys, tanks and barrels in anticipation of some fine “drink’n” next year! Winemakers’ Group Holiday Party. Our holiday party is scheduled for Saturday, December 23, at the Eastlake Clubhouse in Yorba Linda, and this event is sold out. As a reminder to those confirmed to attend, this is a potluck, and we ask everyone attending to bring enough food to serve 10 to 12 people and a bottle of wine per person, either homemade or commercial. 2018 WineMaker Magazine Conference. We are looking forward to the WineMaker Magazine’s annual conference to be held May 17 through May 20 in San Diego. We are hoping to have a large contingent of our winemakers attend and flex our muscles as a fabulous and energetic part of the OCWS! The program is being finalized with full details to come early this month. If you are interested in attending, contact Kevin or visit WineMaker website at www.winemakermag.com for more information. If you have any questions, contact Kevin at Kevindonnelly@ocws.org or by phone at 714.457.7229. Congratulations to all the winners, and a big thank you to all the Hosts!